I’ve been killing it with the savory recipes lately! Maybe it’s the fact that I finally have a kitchen to myself to experiment in, but I’ve really been enjoying creating “fancier” dinners for Brett, Harper and me. I put quotes around “fancier,” because the meals I’ve been creating are still super easy to prepare, but just taste really good. The credit goes to marinades! I’m kicking myself for not jumping on the marinade-train sooner. Marinades are so easy to make, allow meals to be prepped in advance and add so much flavor to bland foods like tofu and tempeh. 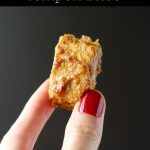 For example, these marinated and baked peanut orange tempeh bites take me about 10 minutes to prep in the morning, bake for 20 minutes right before we’re ready to eat and spruce up our dinner by 100%!! I don’t think I’ll ever go back to baking plain tofu or tempeh again! Tempeh is a soy product that originated in Indonesia. It’s made by binding soybeans together through a fermentation processes, which results in a cake like product that has an earthy flavor. 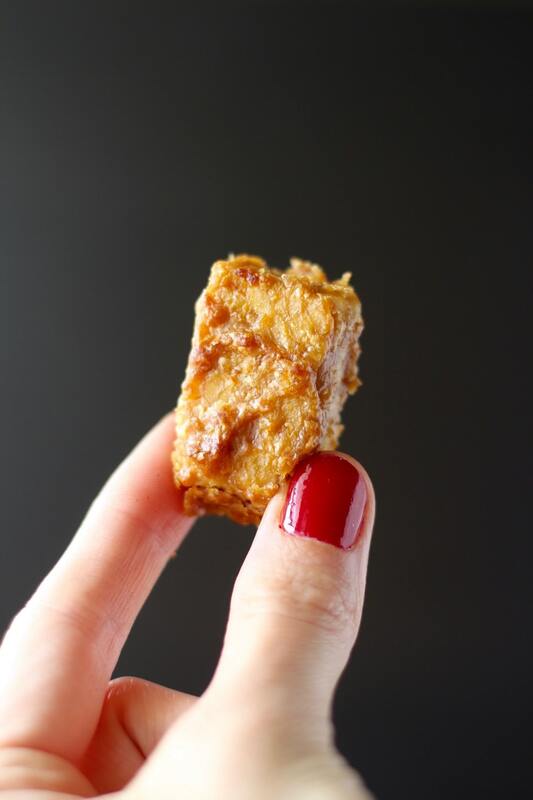 Unlike tofu, the soybeans in tempeh hold more of their original shape providing more dietary fiber, protein and vitamins. For me, it was an acquired taste, but now that I know how to prepare it, I’m obsessed! Everyone has different opinions on which foods are healthy or not, but in my opinion Tempeh is a really nutritious food. It’s a great protein source for vegetarians and vegans. It contains prebiotics and is especially a good source of iron and calcium, which can sometimes be harder to come by when avoiding meat and dairy. 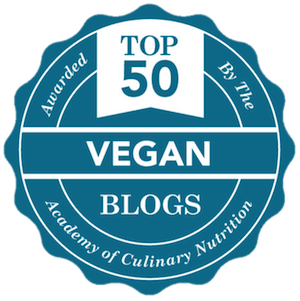 There are lots of ways to cook tempeh. I personally like to boil my tempeh for about 10 minutes before marinating it and then baking it (which is what I did in this recipe). 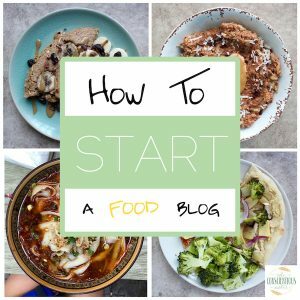 However you can steam it, sauté it, crumble it into sauces to create dishes like vegan tempeh bolognese. Another popular way to cook tempeh is to make tempeh bacon for a hearty breakfast side-dish or a vegan TLT: tempeh, lettuce and tomato! 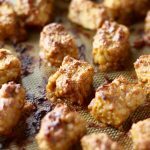 I hope this easy recipe for marinated peanut tempeh bites gets you excited to try out tempeh if you’ve never tried it before. Don’t let it scare you as it is super delicious and easy to prepare! If you end up making this recipe, be sure to let me know what you think in the comments below. If you liked it, I’d love for you to leave a star rating and share it with others! 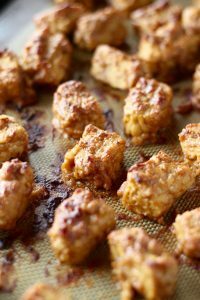 Marinated in a rich peanut and orange dressing, these Baked Peanut Orange Tempeh Bites make for a delicious, hearty entree any day of the week! In a tupperware that will fit the cubed tempeh, whisk together all of the ingredients except for the tempeh. 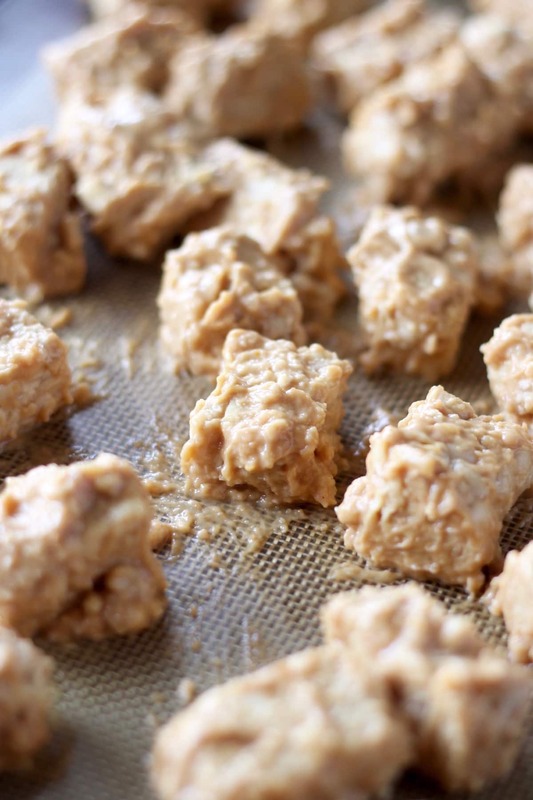 Once combined, add in the cubed tempeh and stir until all of the tempeh is coated in the peanut sauce. Place the tempeh in the fridge and allow it to marinate for 4-24 hours. When ready to bake the tempeh, preheat your oven to 375F/190C and line a baking tray with parchment paper or a silicone baking mat. Pour the tempeh out onto the line baking tray and spread the cubes out so that they are not touching. 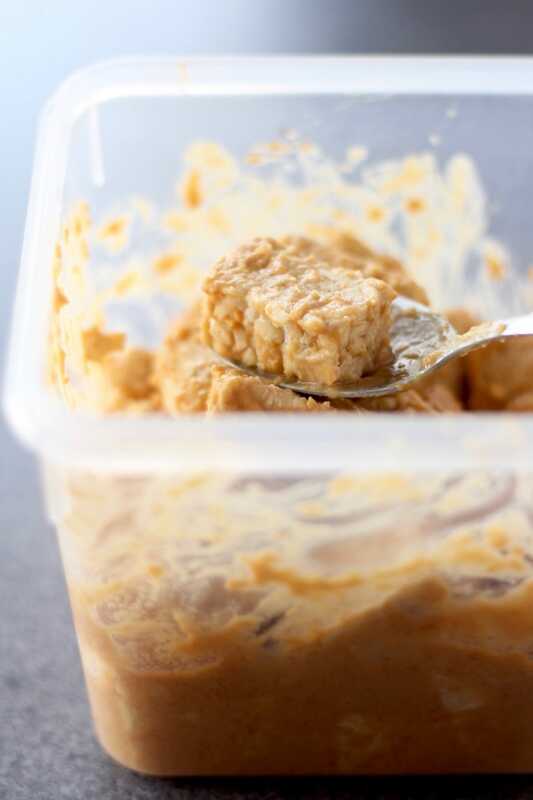 If there is leftover marinade in the tupperware you can spread it onto the tempeh bites that look a little dry. Bake the tempeh on the middle rack for 15-20 minutes or until golden brown on top. Enjoy with steamed rice, roasted veggies and cilantro! *To make these bites completely gluten free, substitute the soy sauce for tamari! I could definitely start being better with marinades as well..This looks amazing. Tempeh is a huge favorite ! Marinades have changed our savory meals for the better! And as for boiling the tempeh, I read to do that on a recipe once and have done it ever since. It helps get rid of the bitter/fermented taste! I boil my tempeh (or steam it) for about 10 minutes total whenever I can, even if I’m not marinating it and just sautéing it. If you’re short on time, however, you can definitely skip this step! Thank you so much for replying and explaining! I had never heard of this, so was curious how it affected the taste and if it was time consuming. 10 minutes I can handle 🙂 . Will give it a try ! I hope you enjoy the recipe Marie! Let me know what you think! !